toast and a banana shake. It was complementary, so I felt guilty ordering more or anything extravagant. The food was very good and filled us up for the long train ride we had ahead of us. Before getting a cab to the train station we walked down the street to find snacks at a corner store. Our ride would be about 17 hours long and we weren’t sure how the food situation would be. But we were assuming it wouldn’t be the Hogwarts Express. We got cookies and crackers and Mary got some beer before going back to check out of our hotel. They had arranged our taxi and gotten the train tickets for us as well. The women, happy and very pregnant, sat with us while we waited for our car. She asked about our travels, where we had been, where we were going and where we were from. She told us that we should feel extremely lucky that our parents were willing to let their young daughters explore the world alone. She said that Vietnamese parents are very protective and would never let their kids travel like us around the world. She thought it was great that we were so young and so independent. She joked that when we come back next time we need husbands to carry our heavy backpacks for us, and I don’t disagree. By then our cab had arrived, a man from the hotel followed behind us on a motor bike to make sure we got to the train station alright, even though it was just a 15 minute ride. 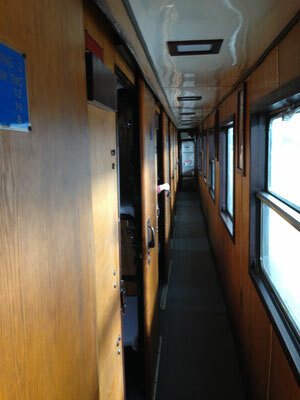 He then helped us to our train and put us in our bunks. We were in a “hard sleeper”, accurately named, with 6 hard bunks. 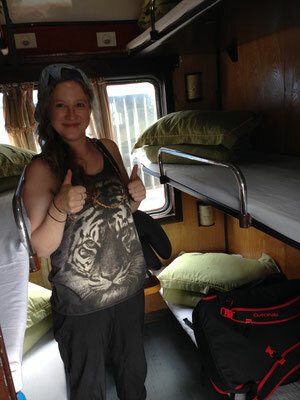 A soft sleeper, which would have cost us $4 more, had only 4 bunks per room and double padded mattresses. I gladly would have paid the 4 bucks, but Mary liked the idea of roughing it, even more than we financially needed to. That’s the thing about backpacking; some people may not want to admit it, but I’m not ashamed to confess that it does give you some sick sense of pride when you see people glance at your backpacks at the airport, or watch you struggle to lift literally all of your possessions onto your back, and then onto your front. The red, indented, marks left on your shoulders from the grinding 40-50 pound bags are little battle scars or rights of passage you earn as you move from city to city and county to country. They separate you from the masses and say, “I’m a backpacker!” They also say, “I’m vulnerable.” I’m working on balancing the two, but for this leg of the journey our backpacks seem to scream, “I’m American.” And that doesn’t feel like something I want to be screaming in Vietnam. 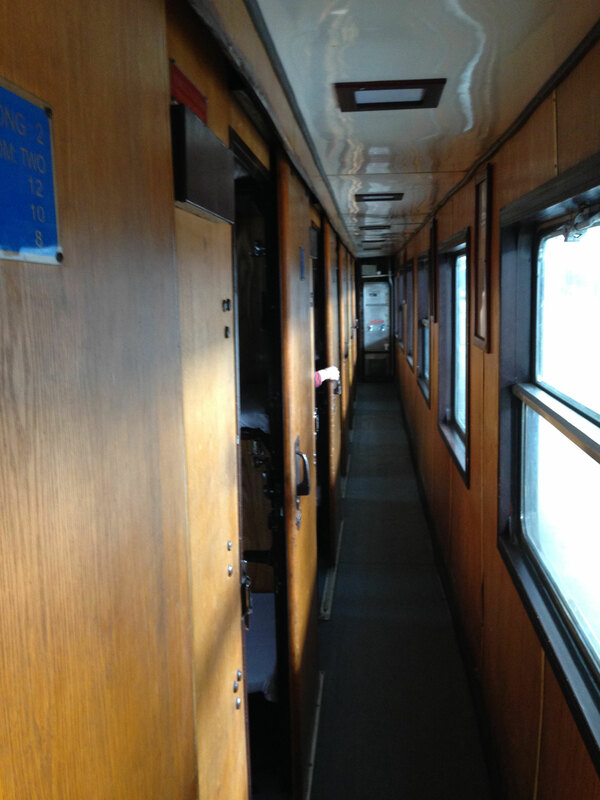 Especially after I saw the looks our fellow cabin mates exchanged and gave us as they joined our compartment. They were all locals. The nicest, was a business type man, who had the top bunk above Mary. He smiled at least and helped her move her bag. The other man above Mary was the younger “Asian Gangster” type that I had been seeing around South East Asian. Reminiscent of white, American, rappers they wear Adidas and jewelry. In the U.S. they would add a grill and tattoos to this façade. On my side was a stern women who refused to climb up to her top bunk, instead standing in the doorway of our cabin for the first 20 minutes of the ride. She was clearly dissatisfied with something and my intuition told me it was my presents in her cabin. The middle bunk housed a, nice enough, mother with her son who was probably 4 or 5. The train ran along the road in the city for about an hour before it succumbed to the farmland with rice fields housing hoards of white ducks and cranes. It stopped fairly frequently though, and never went that fast. The bathrooms were, by far, the worst I have seen so far. Luckily, Mary and I could laugh our way through it. A hard sleeper train for 17 hours is just one of those humbling things you have to do if you are going to travel in your early 20’s. 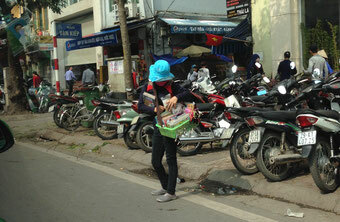 Half way through, about 7 hours in, we stopped in Vinh. It's apparently a big city, as all of our roommates got out here. This was welcome, as the little boy had become fairly obnoxious and unruly. Politeness, manners, and a general respect for people around you don’t seem to be as prevalent in Asia and other Eastern parts of the world. I had, by now, become accustomed to screaming children on planes. It was nice we got a change of pace when the train stopped and we exchanged our roommates for a young mother with two kids and, I’m assuming, their grandmother. The father also got on the train briefly to say goodbye to them before waving from the window outside. When they joined our compartment they immediately said “Hello” to us, which was off the bat friendlier than our previous roommates had been. The youngest child was less than 1 year old. I’m guessing around 8 months, and the boy was probably 3 or 4. They were both adorable and very well behaved. The mother set them on the bunk next to us as the women put away their belongings. Being handed a strangers baby is certainly not an experience many Americans are used to. At least they were good kids, besides trying briefly to eat our headphones which were laying out. The grandmother tried to talk to us, asking what language we spoke. When we told her English she seemed disappointed because she said, from what I could understand, that she spoke nine different languages but no English. I joked back that we spoke no Vietnamese. She asked where we had got on and where we would be getting off. 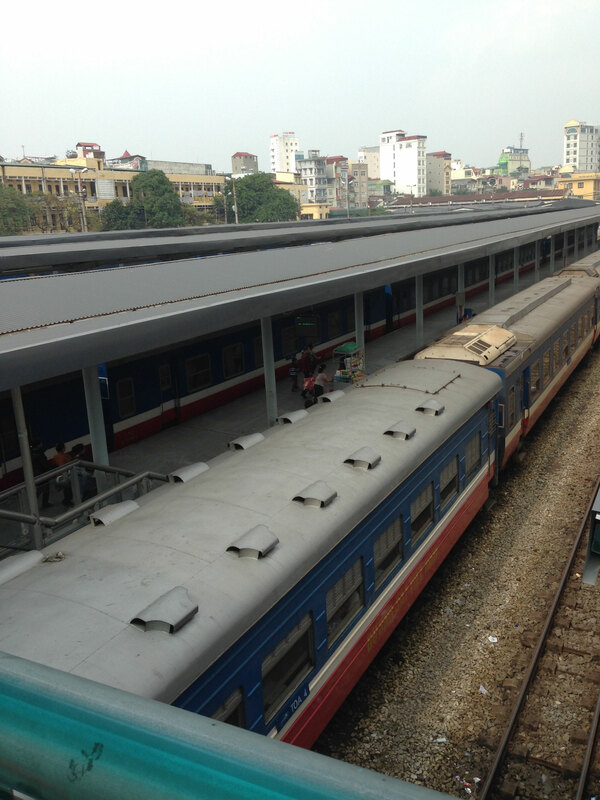 They were also getting off at Da Nang. We couldn’t communicate much past that but we had established a friendly rapport and that alone was comforting. Especially when it came to spending the next nine hours in a 10-foot by 10-foot box, sleeping in the same room with all of our possessions and strangers. A while later, a guard from the train came and slept briefly in the highest bunk above me, perhaps he was on his break. Mary taught me how to play gin rummy and we passed a few hours doing that before bed. Then a woman also joined our cabin, but got off in the middle of the night, only a few hours later. Our door was faulty and would jam closed then slam open whenever the train would stop, but aside from that I actually slept better than I thought I would.